Two weeks ago, we could tell that the weekend ahead wasn't going to bring the best weather. It was most likely going to be rainy and chilly, and going ahead with our plans with a day trip to Cuenca probably wasn't the best idea. 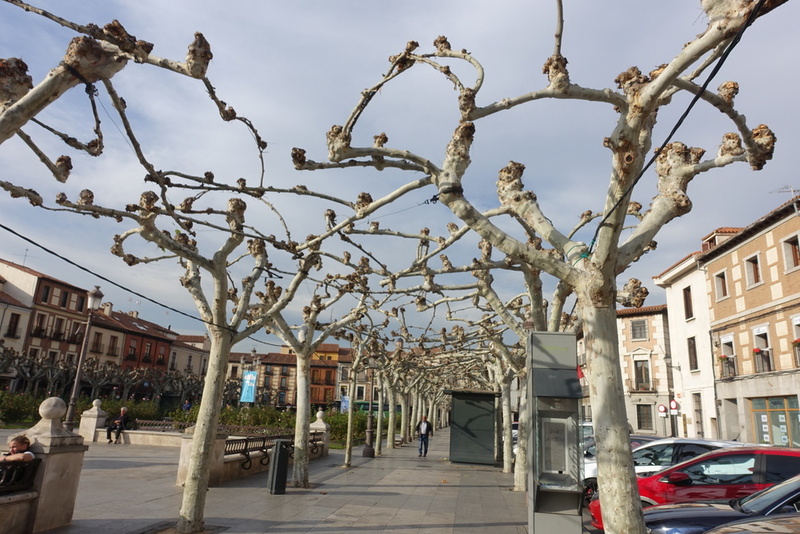 So, we rearranged a little bit and decided to go to Alcalá de Henares, a city about 35 kilometers (22 miles) northeast of Madrid on Friday afternoon while the weather was still good. We took the Cercanias, the train system connected to the Metro that's included with our transport pass, from Atocha and arrived in about 40 minutes (we discovered upon arrival that only my Metro pass covers trips that far on the Cercanias, and we had to pay an additional fare for Danny when he couldn't get through the turnstile - oops - but now we know. The passes are different for those under 26 and those over.). From the station to the historic part of town it was about a ten minute walk, and Danny had a great walking tour of Alcalá pulled up on his phone to give us a little bit of direction and background on what we were seeing. If you ever find yourself in town for the day, you can check it out here. 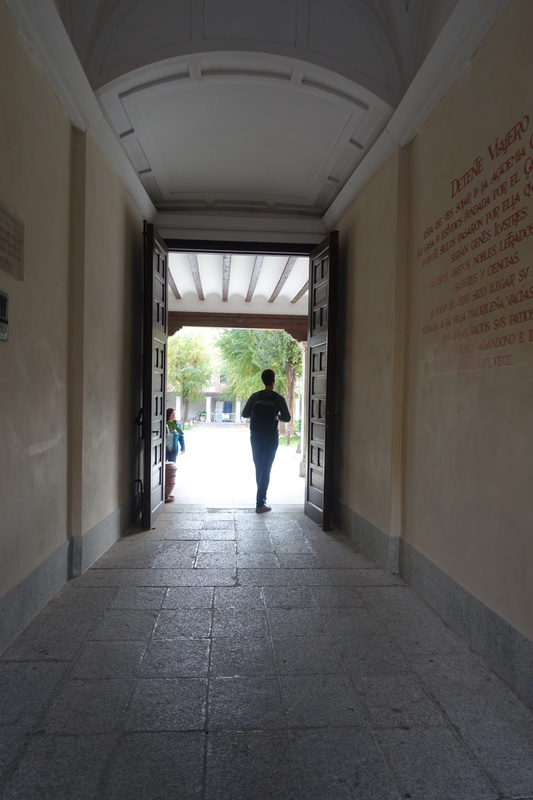 Like the tour suggests, we started at the university, more specifically, the College of San Ildefonso. Since we were there on a weekday, we could visit the patios (outdoor plazas) for free, which were beautiful but simple (it's no Cambridge!) and took about ten minutes to walk through. I was surprised to read later on that close to 30,000 students are enrolled at the university, but less surprised when I found out that there are many, many more buildings than just the few that we saw. 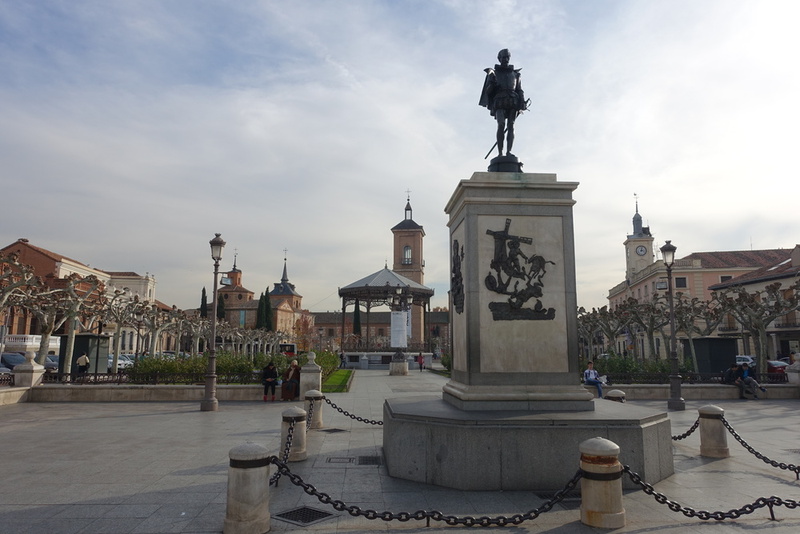 From the university, we walked to Cervantes Square, the main part (as far as we can tell) of Alcalá. 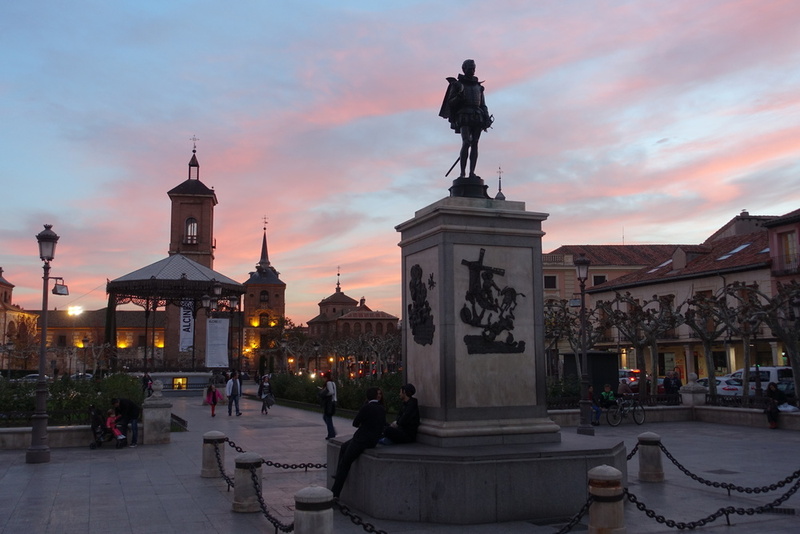 Now, Cervantes Square is named after Alcalá's most famous (former) citizen, Miguel Cervantes. Sound familiar? Yes, he's quite the legend here in Spain, but his name didn't do much for me either a couple of months ago. More on him later, as we visited his HOME!, but for now, a nice statue of him in the square named after him, and square surrounded by very bizarre trees. From Cervantes Square, we walked down Calle Mayor to Cervantes' birthplace. The walking tour strongly suggested we take a few photos on the bench in front of the house, so we obliged, and then entered his home. Mr. Miguel Cervantes (1547 - 1616) was a novelist, poet, and playwright who hailed from Spain, and his most famous book, Don Quixote, is often considered the first modern European novel. He is also frequently referred to as the best Spanish writer of all time, so he, and the town that he is from, are very important to Spaniards. 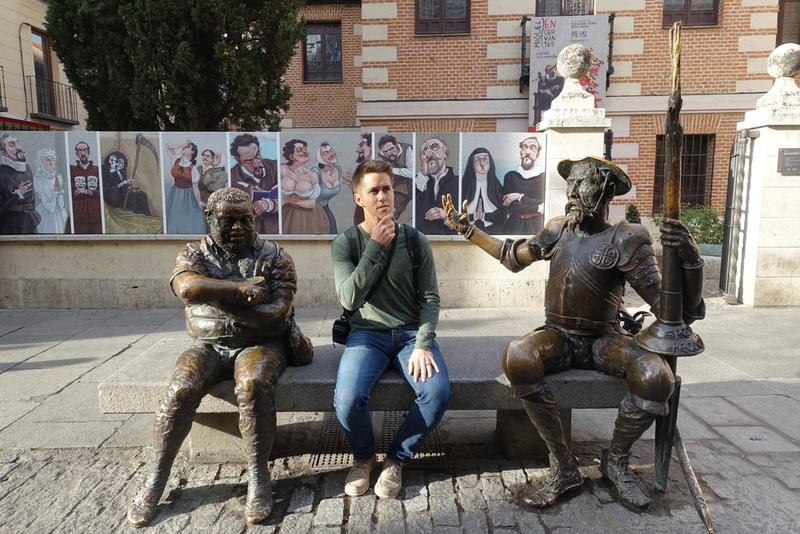 The museum of Miguel Cervantes' birthplace is free, and recreates what life was like during the time of Cervantes, and also has a really large and neat pictorial depiction of Don Quixote in one of the rooms. Unfortunately, we could not understand it as the accompanying words are in Spanish...maybe in a few years. The museum wasn't a long stop for us, but it was worthwhile and took about 20-30 minutes. 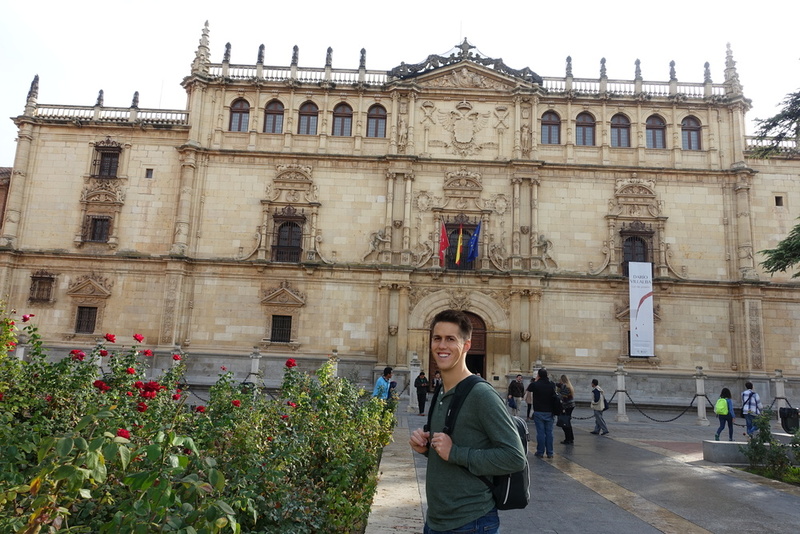 We continued on our walking tour, through Santos Niños Square, onto the Gate of Madrid, and the Archbishop Palace. We found the Archbishop Palace particularly interesting because this is where Queen Isabella I interviewed Christopher Columbus and decided to support and finance his voyage to the Americas. This is where our walking tour ended and where the most anticipated part of our journey to Alcalá began: the pastry tour! 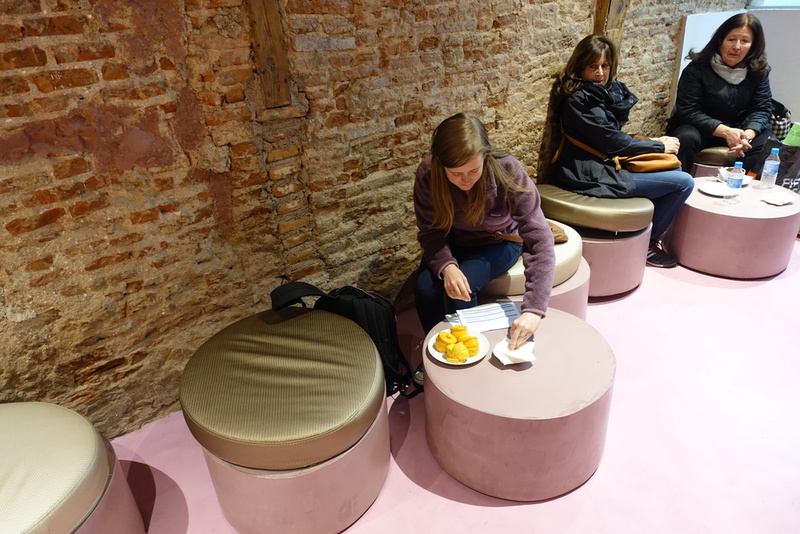 I had found this blog on the pastries of Alcalá and we were both very excited to try a few of them out. Unfortunately, since the blog was written in 2012, and this is 2015, some of the information wasn't too accurate anymore and many of the places we went were closed. We were still able to try some of the delightful pastries, though, and it made some great recommendations for what to try. We started out at Lupe's (as of this writing, the Calle Sebastián de la Plaza, 2 is the only location that is still open) for rosquillas. We didn't know if we'd like them (we were pretty sure, though), and we weren't sure how much they would cost since they charge by the kilogram, so we each got one (they ended up being one euro each, which we thought was fairly pricey), and decided to go from there. After we ate our rosquillas we decided we could each have about 10 more, but we were running a little low on euros and unusually high on self-control and decided to see if we could find them any cheaper elsewhere in Alcalá because surely they all tasted the same. Next, we headed to Salinas bakery for costrada, but ended up getting it at another bakery a few shops down because it looked a little more manageable (costrada is tall! and difficult eat!) and it was really, really good. I regret to inform you that we have both forgotten the name of the bakery and Google Maps is not offering me any help either, so I suppose we'll just have to return. 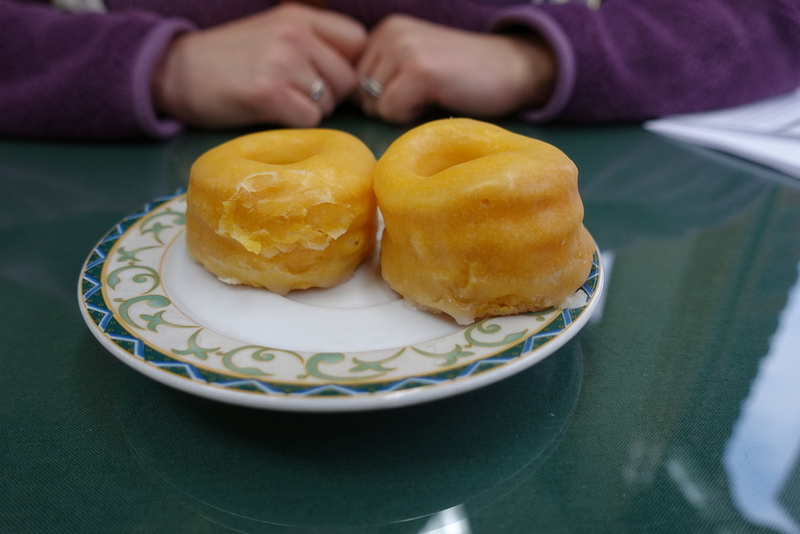 Because we were now addicted to rosquillas, we found a place offering them at what seemed like a good price (four for three euros) and sat down for some more, but we soon realized that not all rosquillas are created equal and we immediately wished we had sprung for Lupe's. The place was cute and trendy (unlike Lupe's) but the rosquillas were no bueno. We walked back into the Cervantes Square for the sunset, and once it was dark, walked to the Cercanias station and were in Madrid in time to make dinner. 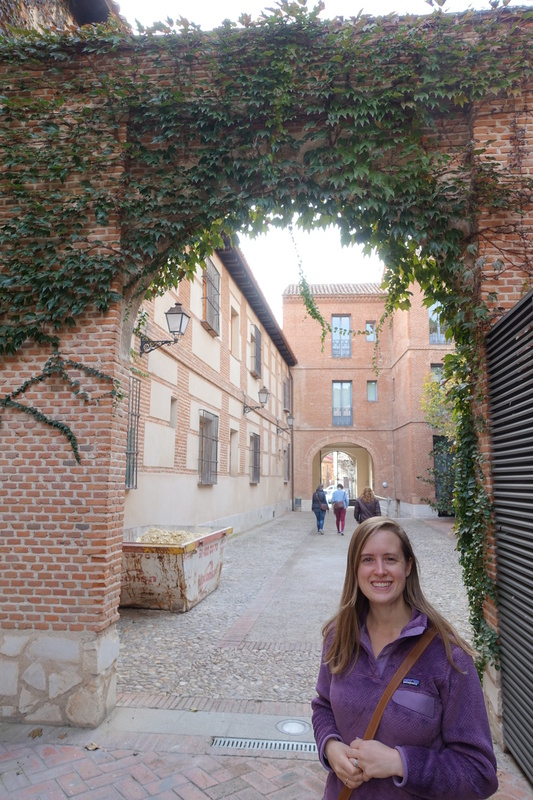 Our afternoon in Alcalá was lovely, and just what we needed before the rain and cold came the next morning. In fact, I think that day was the last time we left home without our heavy jackets (just in case, you know). We'll definitely be back, if for no other reason than for Lupe's rosquillas and maybe a slice of costrada too. It's the perfect quick, cheap half-day from Madrid.